If you have been charged with a second driving under the influence (DUI or DWI) offense in Mesa, you could face serious penalties, including mandatory minimum jail sentences, driver’s license suspensions, installation of an ignition interlock devices, fines, and/or a criminal record. Many times, an individual who has been charged with drinking and driving in Arizona believes they are capable of operating their motor vehicle. Even if they do not blow over the legal alcohol concentration limit of .08, they can still be charged with driving under the influence if the arresting officer believes they are impaired to the slightest degree. Generally, reaching an alcohol concentration level of .08 is not difficult and can result from consumption of even one drink. The limit of .08 is very low and can generally be reached when anyone has consumed only one or two alcohol drinks, depending on their weight and body type, how long they have been drinking, and whether they have eaten any food while drinking. If you have been charged with a 2nd DUI in Tempe, or any of the surrounding areas in Arizona, including Mesa, Gilbert, Chandler, Scottsdale, Phoenix, or East Valley, contact the Law Office of James E. Novak. Attorney James Novak is knowledgeable in all areas of Arizona’s DUI laws and will make every effort to fight the allegations against you. 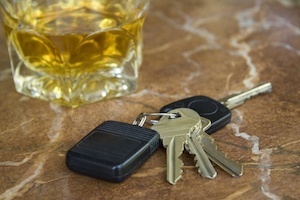 Call the Law Office of James E. Novak for a free consultation at (480) 413-1499 about your second alleged DUI offense. The alleged offender has an alcohol concentration of .04 of higher while operating a commercial vehicle that requires the driver to have a commercial driver’s license. An individual may be considered “under the influence” in Arizona if they are impaired to the slightest degree under ARS § 28-1381. If a law enforcement officer believes a DUI suspect is impaired at all from the consumption of alcohol or from another controlled substance, they can be considered under the influence and arrested for DUI. Arizona laws provide for certain presumptions regarding whether the alleged offender was under the influence of alcohol. Although these presumptions are believed to be true, they are not guaranteed facts and can be rebutted be factual evidence. If an individual has an alcohol concentration level of .08 or higher within two hours of driving or having actual physical control of a vehicle, they are presumed to be under the influence. If an individual has an alcohol concentration level of .05 or less up to two hours after driving or having actual physical control of a vehicle, they are presumed to not be under the influence. If an individual has an alcohol concentration level between .05 and .08 within two hours of driving or having actual physical control of a vehicle, they may or may not be under the influence. Additionally, if an individual has an alcohol concentration level of .08 or higher when arrested for DUI, they can be charged with per se driving under the influence. This means law enforcement officers can automatically arrest the alleged offender and charge them with DUI if they have an alcohol concentration level of .08 or higher. Generally, law enforcement officers do not have to prove actual physical control (APC) for the purpose of driving under the influence if the alleged offender is actually operating the vehicle, driving, or behind the wheel of the car. However, actual physical control can become an issue if the alleged offender was sleeping behind the wheel when arrested for DUI or was not actually driving, but had the key in the car’s ignition. Although “actual physical control” has not been specifically defined under Arizona law for the purpose of driving under the influence, the Arizona Supreme Court held in Arizona v. Zaragoza that APC is determined by the totality of the circumstances of whether the individual’s current or imminent control of the vehicle presented a danger to the driver or the public at the time of the arrest. This means even if the alleged offender was not actually driving at the time of the arrest, they can still be charged with a DUI in Arizona. Whether the vehicle’s motor was running. These numbers are used to measure the amount of alcohol present in an individual’s bloodstream. If an alleged offender has a BAC of .08 up to two hours after operating or having actual physical control of a motor vehicle, they are presumed to be under the influence of alcohol, and can be charged with a per se DUI offense. The alcohol concentration level of .08 in Arizona is generally very low and can be reached after consuming only a few drinks. For example, an individual who weighs 120 pounds probably has a BAC of .054% after two drinks, which may indicate they are under the influence. An individual who weighs 120 pounds probably has a BAC of .081 after having three drinks, which is over Arizona’s legal limit and they are presumed to be under the influence. In Arizona, one drink is equivalent to a one-ounce shot of 86 proof liquor, one 12 ounce beer (4.5% alcohol by volume), or one 3 ounce glass of wine. Arizona Revised Statutes – Chapter 4 of Title 28 of the Arizona Revised Statutes defines driving under the influence offenses and penalties in Arizona. This link is to a second DUI offense and the penalties an individual can receive if they are convicted of this offense, which is also under ARS § 28-1381(K). Arizona Ignition Interlock Laws – This link is to the ignition interlock device requirements in Arizona for driving under the influence offenses. Installation of an ignition interlock device is mandatory for at least one year for every DUI conviction, including second DUI. Contact the Law Office of James E. Novak today for a consultation about your second drinking and driving offense throughout Maricopa County in Arizona. This includes Mesa, Tempe, Gilbert, Chandler, Scottsdale, Phoenix, and nearby areas. James Novak is an experienced Mesa DUI defense lawyer who will make every effort to help you achieve the most desirable outcome for your particular situation. Contact the Law Office of James E. Novak at (480) 413-1499 for a consultation to learn more about your legal options.